This New 2 bedroom Ground floor apartment sleeps four persons and has an allocated parking space. The apartment is located just behind the steps that can be seen in the photo opposite. There is a Patio area at the back of the Apartment. The shared swimming pool is only a minute walk away. There is a lounge/diner and kitchen area combined, the kitchen includes a cooker and Fridge, the lounge area is complete with a T.V.and Video. There is also a bathroom with shower facilities. 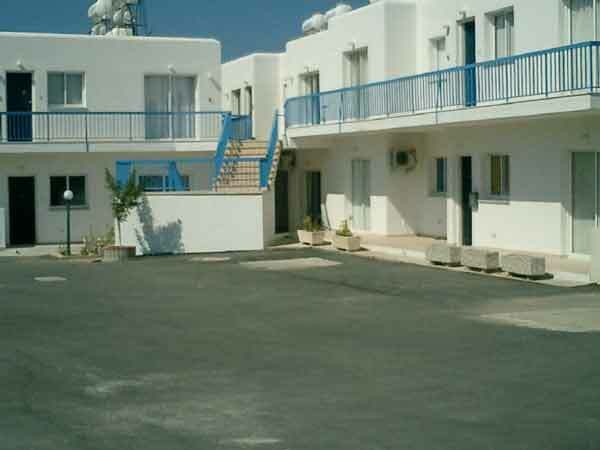 It is ideally suited for those who do not wish to hire a car as the surrounding area is on the flat with a Shop and Restaurant a couple of minutes away and a host a further shops, restaurants and banks within a 5-10 minutes walk. The sea front can walked in 20 minutes and the harbour in 30 minutes.